One of my new favourite food sites on the internet is food52. It's a brilliant combination of recipes, news, interesting articles and much more, all masterminded by the fantastic Amanda Hesser and Merrill Stubbs. It's a great resource - when I was having problems with waffles the kind people of foodpickle helped me sort it out. I've also had great fun reading about The Bib, a knockout tournament for New York restaurants. They also hold contests each week for recipes on a theme. The winning recipe is then featured in their cookbook. I've been lying in wait for a theme I could work with (flank steak, chili or corn on the cob are not really my area of expertise) and finally this theme came along: Your Best Fair Food. As a result I spent most of today in the kitchen making batches of churros. When I think of fairground food, they're the first thing I think of. I first made churros last summer by adapting Louise Mellor's recipe (from when she sold churros at Orange County Fair) and became addicted. Today I decided to try out an idea I had a while back of incorporating the cinnamon (and other spices such as nutmeg and cloves) into the paste. After a few trials, I created something I'm proud of. So, if you'd like to check out my new recipe for spiced churros, head over here. Yummy! Churros are addictive. 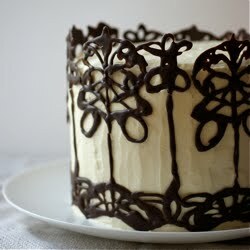 I wish I could taste one right now. 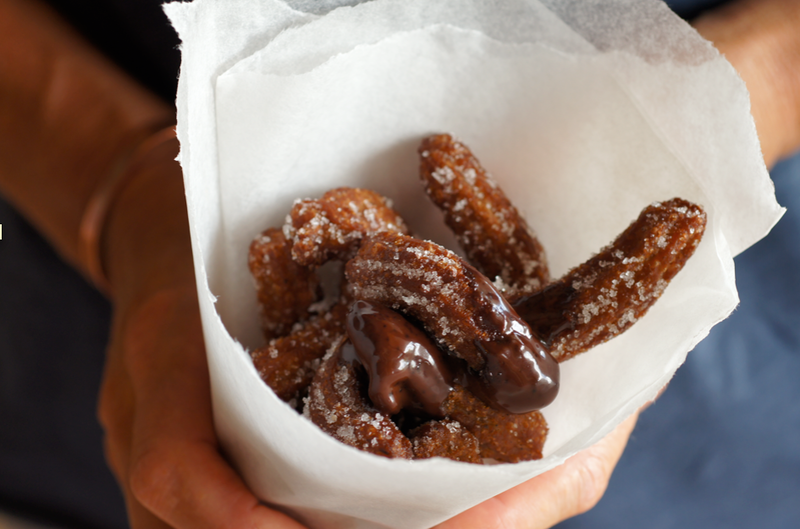 i love churros - i really want to try out your recipe soon. adding spices to the batter is a great idea! by the way - thank you emma, for commenting on my blog! at first when i started it, i didn't include any recipes and i didn't write anything, i'm starting to change that now. since you want to become a professional pastry chef, it might interest you to look at the photos of my paris internship back in may. (to be found under the month of may... obviously). hope you take a peek and enjoy! They look amazing! Churros are so deliciously evil. I hope you win! Oh my God these look amazing!!!!! I love churros. Churros are one of my all-time favourite snack foods - I first had them aged 15 on a Spanish exchange in Barcelona and have never looked back! The combination of crisp outside, soft, sugary dough inside and melting chocolate sauce is just unbeatable. Love the addition of cinammon and nutmeg in your recipe - I ate something similar at Salt Yard in London recently and it was amazing. Wasn't sure how to recreate but will be trying your recipe as looks gorgeous. I've most certainly never had them spiced but I would love to try this combination. It's been quite a long time since I've had them homemade, and fresh. My Kitchen in the Rockies - they're definitely addictive! Such fun to make too. Jennifer (poirier) - I remember looking at your blog around when you started your internship (I guess from a comment). I had another look - lovely photos. How was the experience? Would you recommend it? Steph - So evil. So addictive. My thighs hate my hands for making them! Elle Audrey Marie - I hadn't seen it before either so thought it was worth a try. They're so much better when fresh and I find homemade ones generally are more reliable than the various other places I've tried them.